Wireless technology took a big step forward when Wi-Fi was born. Today, with common, inexpensive wireless access points you can pick up at any office supply or electronic goods store, you can hit internet connection speeds in excess of what we used to have over a copper cable. The adoption of wireless was incredibly swift. Within five years, just about everyone I knew had a wireless router at home to bridge the gap between their PC and their Internet service. And that changed computing big time. No longer did you have to be tethered to connect to the Internet. If you wanted to set up a computer in your game room to stream off a music service while you shot some pool, you didn’t have to hire a cable guy to put in a new run (or in my case, “do it yourself”). In fact, so many electronic devices automatically connect and sync with other devices today that you rarely need to worry about any cables at all these days. Of course, there is one notable exception to that — a big hurdle between us and 100% cable-free devices. I’m talking about your device’s battery life. While we’ve figured out how to transmit data at acceptably high speeds over the air via radio waves, power is a whole different story. You still have to plug everything into a power outlet at some point, or else it’s dead as a doorknob. And that’s true for even your most efficient networked devices. Every networked device on the planet has the same fatal flaw. Nothing’s more annoying than having to go plug into a charger when you really, really want to use a device right now. And if you carry a device in your pocket and the charging port gets gunked up with lint so that it doesn’t work, it’s frustrating. This problem only seems to get worse as the connectors shrink. I think I’ve developed an obsessive-compulsive disorder with always having everything plugged in while I don’t use it. And that’s not always at a handy location. Imagine never having to change a battery in your remote or having to charge a wearable item like fitness electronics. Imagine just leaving your phone around the house and having the battery constantly charged. Imagine installing new intelligent devices making your home “smart,” and not having to worry about putting in outlets or running unsightly cables. We’re on the verge of wireless power… and while many companies are working to make it possible, I think one microcap in particular will race to the head of the pack. That’s because this tiny company is headquartered just 13 miles from corporate offices of Apple, Inc. And I believe the two companies have quietly struck a deal that will come to light on Sept. 7. This company has developed a way to send power over the air. And I expect this tech is going to take the world by storm. We already transmit power over short distances regularly. Without that old technology, we wouldn’t have a good way to change voltages and currents in our power grid. We also use these types of systems on a much smaller scale in our electronics. These components, known as transformers, use electromagnetic fields to induce electrical currents in conductors. It’s relatively efficient. The wireless charging pads you can get for some of your devices these days also work on this principle. Yet, as I mentioned, this is only good for short distances. But, we know how to transmit data over very long distances and have done so for well over a century. We use radio frequencies to do the job. A transmitter converts an electrical signal into a radio wave. When it reaches a receiver, the radio signal gets turned back into an electrical one and amplified. 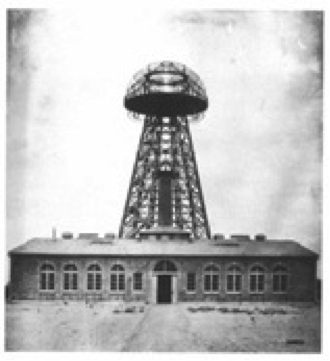 The “Tesla Tower” in 1904 in Long Island, New York. With the right technology, this idea can also be extended to the transmission of power over the air. It’s possible that this was what famous inventor Nikola Tesla dreamed of over 100 years ago. He conjured up the idea of wireless communication, although Italian inventor Guglielmo Marconi is the person who usually gets the credit for the invention. But Tesla wanted to go further. 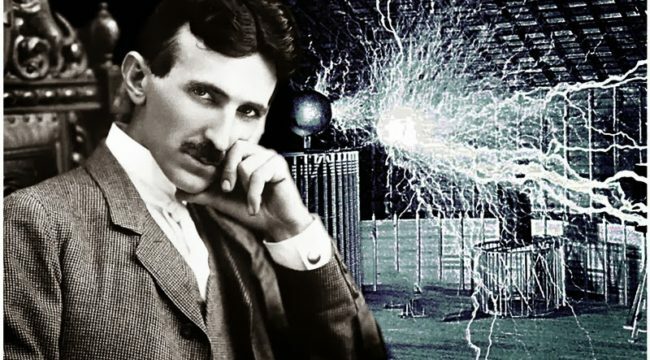 He believed he could build a transmitter that could send power all over the world. After working on an antenna tower, investors eventually pulled the plug on his project. After all, how could you meter and bill someone for their electrical usage if power was being sent over the air? Anyone might be able to tap in. That’s not good for business! Tesla’s ideas never saw fruition, but this tiny company is well on its way to changing that. What makes wireless power possible today is new, intelligent technology. See, the problem is, if a transmitter beams RF (radio frequency) energy in all directions, a lot of power is wasted. This company’s transmitter takes that wasted energy and puts it to use. It uses an intelligent antenna array that can direct beams operating in the same range as Wi-Fi to a device with the appropriate receiver. The receiver in the device is also smart, and communicates with the transmitter over Bluetooth so that the two ends of the connection can shake hands and negotiate a connection. The energy can then be sent from point to point in a focused manner. Since the beam is focused, loss of power is less of a problem. With the current iteration of this technology, properly-equipped devices can be charged anywhere within a 15-foot radius. That could be a smartphone, a tablet, or another device with a tiny receiver chip inside. Each transmitter can handle up to 12 devices, and just a few transmitters could cover a typical home or office. Within 5 feet, the beam can provide 4 watts of power, and a full watt all the way out to 15 feet away. This isn’t just an idea on paper somewhere. The company has actually developed working hardware. Underwriters Laboratories has independently tested the performance of the system and validated that it works. That’s plenty of power for most small, portable electronics like an iPhone or Android smartphone. And you can manage what devices get power and when they do so through an app or web based portal. This technology could transform the entire consumer electronics industry. And the first big consumer tech company to use its technology would have a huge leg up on the competition. It redefined the personal computing market in the 1980s… It disrupted the music industry at the turn of the century… It invented the modern smartphone as well as the tablet computer. Obviously I’m talking about Apple. This company’s wireless charging technology would give this innovative company name the edge it needs to keep its market leadership position. In fact, they may already be working together. It has said that it’s working with an undisclosed, “key strategic partner.” I believe that player is Apple. I think we’ll first learn about any collaboration between the two companies around Sept. 7. That’s the earliest Apple is expected to launch its newest iPhones — which may include wireless charging technology. If Apple announces it has a device that never needs to be plugged in, it would be a huge blow to major competitors such as Samsung and HTC. Wireless power is just in its infancy, but the potential for gains in the thousands of percent are possible for early investors. The market cap of this company is just $215 million. That’s very close to what Cisco’s market cap was during the infancy of the commercial internet — just $226 million when it listed on the Nasdaq on Feb. 23, 1990. A visionary investor could have reaped a profit of 162,000% on this microcap if he had just held CSCO shares for a decade from its IPO. The time to invest in wireless power is now.